Citrine & Sterling Diamonbar Art Deco Line Bracelet with Buckle by Wachenheimer Bros.
Home>Archives>Citrine & Sterling Diamonbar Art Deco Line Bracelet with Buckle by Wachenheimer Bros. 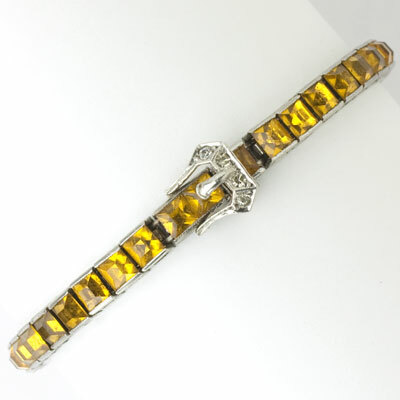 Though unsigned, this quintessential Art Deco line bracelet with citrine-glass squares channel-set in sterling silver is a Diamonbar bracelet. (I have had the identical bracelet with sapphire-glass stones.) 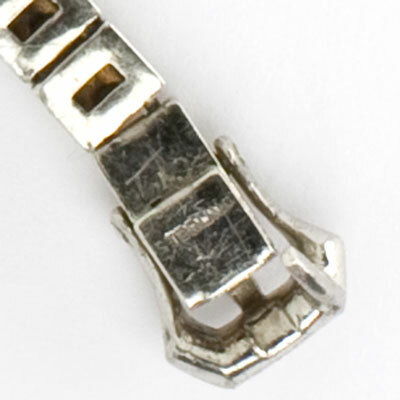 The diamanté buckle is part of the clasp. 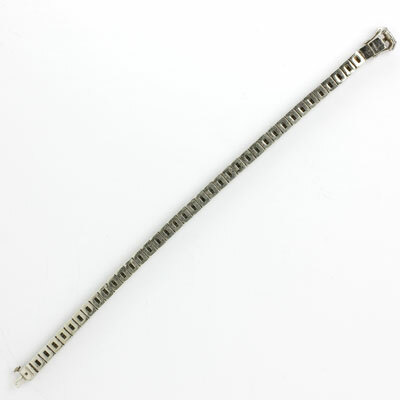 This bracelet was made for a slim wrist, so please note the bracelet length (6 3/4″) and check your wrist size before purchasing this piece. I have Art Deco necklaces and earrings that look great with this shade of citrine — scroll down to take a look. The design and construction of this tiered necklace, a variation on the 1920s chicklet-style, is first class. 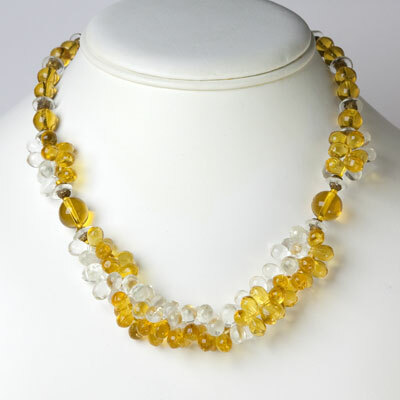 Golden yellow, square-cut glass stones alternate with oblong crystals to form the necklace and tiered centerpiece. Round dangling citrine-glass stones add the movement that was so essential in the Art Deco era. All of the stones are faceted and mounted in decorated, silver-tone metal. The construction makes me think this piece was made in Europe. This divine jewel, which I initially purchased for myself, closes with a spring-ring clasp. Scroll down to see a number of Art Deco earrings and bracelets to wear with this piece. 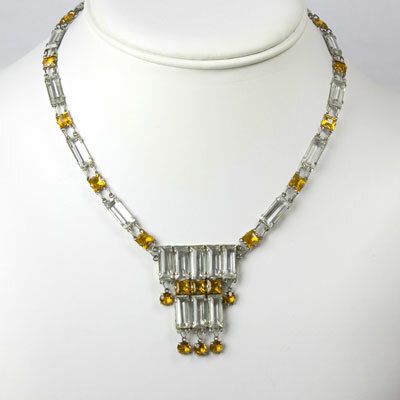 This classic and well-made Art Deco chicklet necklace features square-cut, faceted citrine glass stones set in sterling frames with a spring-ring clasp. The high-quality of this piece is due to the use of sterling silver in the stone settings, which was unusual in this type of necklace. Scroll down to take a look at bracelets that look great with this piece. 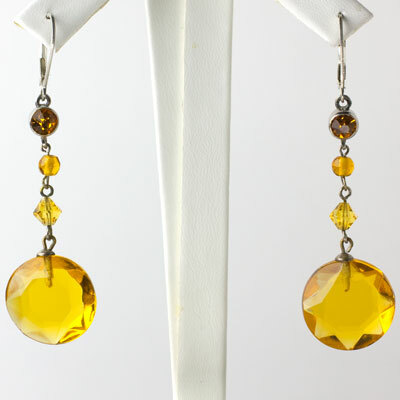 These classy citrine dangle earrings are fashioned from faceted glass stones shaped like gumdrops. They are suspended from citrine-glass beads and a matching stone set in silver-tone metal. The original screw-backs were converted to sterling silver ear wires with lever backs for pierced ears by my expert jeweler. If you don’t have pierced ears and are looking for similar earrings with screw backs, scroll down to see what is available. Included are necklaces and bracelets that complement these earrings, an essential jewelry wardrobe staple for those who look best in warm colors. 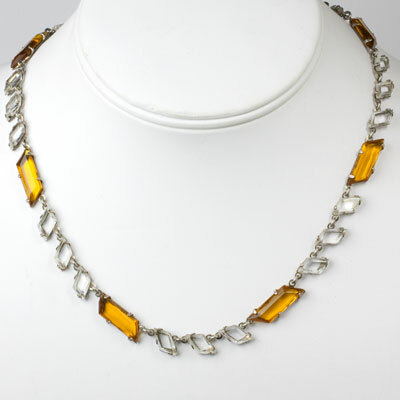 Clusters of citrine and clear glass beads at the center of this wonderful 1920s-1930s Art Deco necklace give it a three-dimensional look. 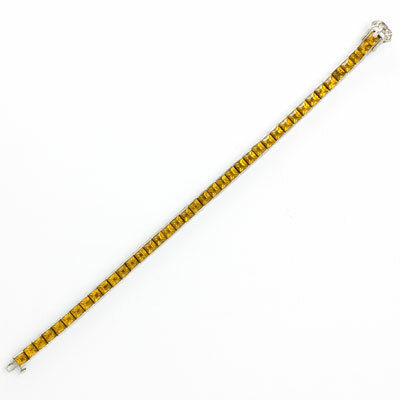 Glass spacers flanked by yellow metal are interspersed with the remaining graduated citrine glass beads. This piece, which closes with a screw-barrel clasp, is probably European in origin. This necklace has been restrung by my expert jeweler. You can wear this piece with a number of my Art Deco earrings – scroll down to see a selection. 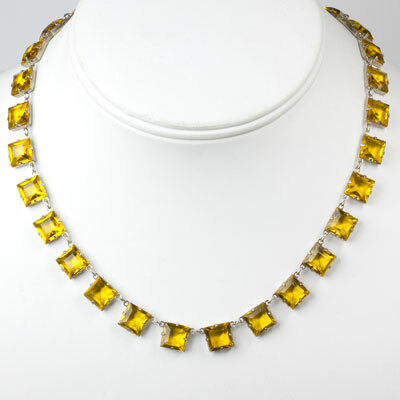 This variation of an Art Deco chicklet necklace is fashioned from deep-citrine-glass stones and crystals in the shape of parallelograms. The stones are set in unmarked silver-tone frames. Some of the crystals have tiny corner chips, but they are not visible when the necklace is worn. The combination of colors and the shape of the stones make this jewel unique and versatile. 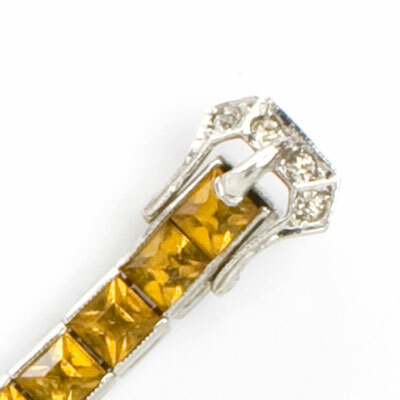 Scroll down to see Art Deco pieces that coordinate well with this shade of citrine and with crystal.